Runnerup in the Sarah Palin interview sweepstakes is CBS Evening News anchor Katie Couric, who will hit the campaign trail with the Republican veep nominee on Sept. 28-29. CBS says that Couric will both quiz Palin and receive exclusive "behind-the-scenes access" as the Alaska governor travels both alone and with running mate John McCain. Part 1 of their collaboration will air on the Monday, Sept. 29th Evening News. Palin's debate with Democratic counterpart Joe Biden will be just around the corner (Oct. 2nd) by then. 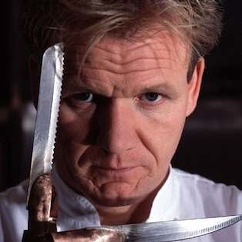 ***Chef Gordon Ramsay will be wielding his cutlery and even sharper tongue for a few more years on Fox. The network has signed him to two more editions of Hell's Kitchen and at least another ladle of Kitchen Nightmares. Ramsay also will preside over a self-standing special and a third series, both yet to be specified. ***TNT has acted fast in renewing its new Raising the Bar legal drama after just three episodes have aired. Bar, from groundbreaking producer Steven Bochco (Hill Street Blues, L.A. Law), will get a second season while TNT's Saving Grace, starring Holly Hunter, has been greenlighted for a third. Bar premiered to mostly tepid reviews but its premiere episode set record ratings for an advertiser-supported cable network with 7.7 million viewers. TNT programming executive Michael Wright says he's also been happy with "the creative growth of the show across the episodes and to see these characters and stories pay off." Bochco's last basic cable series, FX's Iraq war drama Over There, got discharged after just one season. ***HBO's John Adams miniseries led the way with eight Emmys at last weekend's "creative arts" ceremony. Also faring well were AMC's Mad Men (4) and NBC's 30 Rock (3). The trio led all Emmy nominees in their respective categories and will be back in the hunt for the "major" hardware during ABC's Sunday, Sept. 21st ceremony. David Letterman tells Rolling Stone that he's now content to run second behind Jay Leno in the late night ratings wars. That said, he continues to book big-name guests, including the world's fastest man. Jamaican sprinter Usain Bolt, who wowed the world at the Summer Olympics, will make his first U.S. talk show appearance Sept. 24th on Late Show with David Letterman. 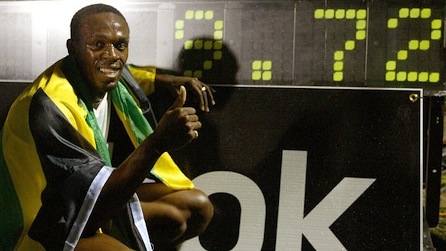 Bolt flashily set world records in the 100- and 200-meter races, leaving competitors astonishingly far behind. Maybe he can elevate Letterman to No. 1, too -- at least for a night. Also, this just in: The Late Show Top 10 list for Thursday, Sept. 11 will be read by Al Pacino and Robert DeNiro, whose Righteous Kill film opens on the following day. They'll be emoting on the "Top 10 Reasons I Love Being an Actor." ***This should be intriguing. Operatic singer Josh Groban will perform a medley of timeless TV theme songs during the Sept. 21st prime-time Emmy awards ceremony on ABC. A publicity release says that Groban's selections will include the themes for The Brady Bunch and The Simpsons. But will the latter theme, which has no words, leave him speechless? ***TBS has renewed The Bill Engvall Show for a 10-episode third season. The sitcom's name-in-the-title star learned the standup trade performing in North Texas comedy clubs before striking it rich in Hollywood. "There's something about this cast and this show that gives you a good feeling inside," TBS exec Michael Wright. Engvall plays a family counselor who's married with three oft-unruly kids. ***CNN continues to try to do the right thing while Fox News Channel and MSNBC square off as loud-talking political polar opposites. The grandfather of cable's all-news networks is launching a new weekly series, hosted by Roland Martin, that "will challenge his guests and viewers to leave the political talking points behind and join him in a no-nonsense approach about what voters are actually talking about." The first show, titled Seven Weeks to Go, airs on Saturday and Sunday (Sept. 13-14) at 7 p.m. central each night. The next one will be called Six Weeks to Go, so I think you know where this is going. 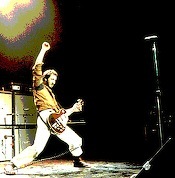 Pete Townsend, Barbra Streisand, Roger Daltrey to get feted. President Bush will know who his successor is when he and Laura preside over their last Kennedy Center Honors ceremony on Dec. 7th. It should be a very fun night regardless, with an impressive batch of new honorees announced Tuesday. They are Barbra Streisand, Roger Daltrey and Pete Townsend of The Who, George Jones, Morgan Freeman and Twyla Tharp. CBS, which will television the inductions later in December, has brought this classy show to home screens every year since the Honors were established in 1978. And who got feted back then? Fred Astaire, Richard Rodgers, Arthur Rubinstein, George Balanchine and Marian Anderson. For a complete list of honorees, go here. ***ABC anchor Charles Gibson has won the inaugural Sarah Palin sweepstakes and will be interviewing the Republican VP nominee on Thursday and Friday in Fairbanks and then Wasilla, Alaska. ABC says the first excerpts will air on Thursday's World News and also be platformed on the network's Nightline, Good Morning America and 20/20. ***NBC/MSNBC newsman David Gregory seemingly has the pole position to become the next moderator of Meet the Press after Tom Brokaw completes his interim duties sometime after the presidential election. Hoping to rid itself of a messy situation, MSNBC has named Gregory to anchor coverage of the presidential debates and election night. Gone is the two-headed monster of Keith Olbermann and Chris Matthews, whose pointed opinions and occasional feuding finally were deemed unseemly after they helmed coverage of the Democratic and Republican conventions. Matthews and Olbermann will remain as analysts and hosts of their respective weeknightly programs, Hardball and Countdown. Their semi-demotions were first reported Monday by The New York Times in a story headlined, "MSNBC Takes Incendiary Hosts From Anchor Seat." 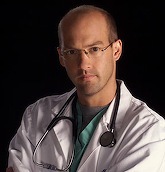 Charter cast member Anthony Edwards will return to ER for one episode in the series' 15th and last season, NBC says. Edwards, who played Dr. Mark Greene, left the show near the end of the 2001-'02 season. He'll be back on a Nov. 13th episode titled "Heal Thyself." "We had hoped to bring back some of ER's stars for the final season and think that our loyal fans will enjoy seeing some of the show's most beloved and memorable characters," executive producer John Wells says in a statement. Another original cast member, Noah Wyle, has been featured in new promos for ER. So expect him back as Dr. John Carter. No word yet on whether George Clooney might also give ER a final fling as Dr. Douglas Ross. Now that'd be big. ***Former Friends star Jennifer Aniston has been signed to return to her former Thursday night digs for a one-episode guest shot on NBC's 30 Rock. Aniston gets to play "Fatal Attraction-like stalker" Claire Harper, an ex-roommate of Rock star Liz Lemon (Tina Fey). "Jennifer is not only incredibly lovely to have around, she also has what the young people would call 'mad skills,' " joshes Fey. Rock, with 17 Emmy nominations currently in tow, won't return until Oct. 30th. ***The Emmy people are making it a point to pair intriguing couples as presenters for the Sept. 21st ceremony on ABC. Just announced are Don Rickles and Kathy Griffin. He'd better call her a hockey puck, and she'd better call him a has-been. Or else what's the point?